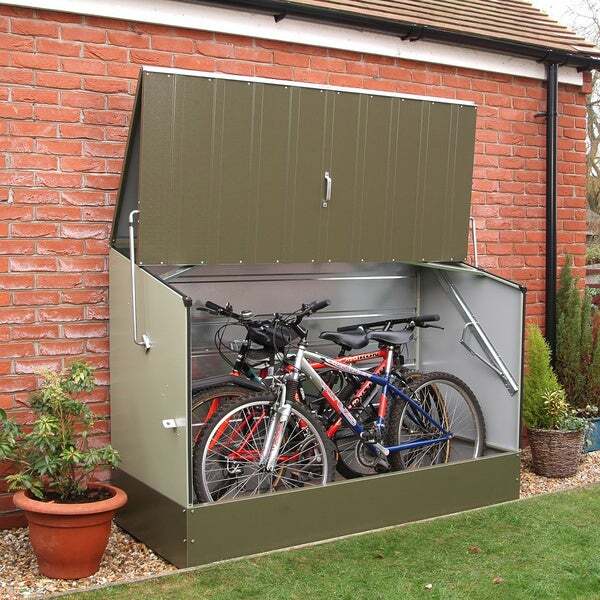 The Trimetals Cycle Locker Storage Shed holds up to three adult bikes (may vary with bike size and design) with a spring assisted opening action for complete and easy access. Lock the unit using the one or both of the padlock points on each side or bolt down the unit from the inside for increased security. Perfect for mountain, racing or standard cycles. "How many bikes will this fit? In the photo it looks like 3, but we would need room for 4." Hello BethanyC, this it is designed to accommodate all types of mountain, racing or standard bicycles. Depending on the bicycle design, the unit will hold up to 3 at a time. Thank you for shopping with us. Versa-Shed Steel Storage 5 x 3 ft.